1 Does not include biofuels that have been blended with petroleum–biofuels are included in "Renewable Energy." 2 Excludes supplemental gaseous fuels. 3 Includes less than 0.1 quadrillion Btu of coal coke net exports. 4 Conventional hydroelectric power, geothermal, solar/PV, wind, and biomass. 5 Includes industrial combined-heat-and-power (CHP) and industrial electricity-only plants. 6 Includes commercial combined-heat-and-power (CHP) and commercial electricity-only plants. 7 Electricity-only and combined-heat-and-power (CHP) plants whose primary business is to sell electricity, or electricity and heat, to the public. Includes 0.1 quadrillion Btu of electricity net imports not shown under "Source." Primary energy in the form that it is first accounted for in a statistical energy balance, before any transformation to secondary or tertiary forms of energy (for example, coal is used to generate electricity). • Sum of components may not equal total due to independent rounding. 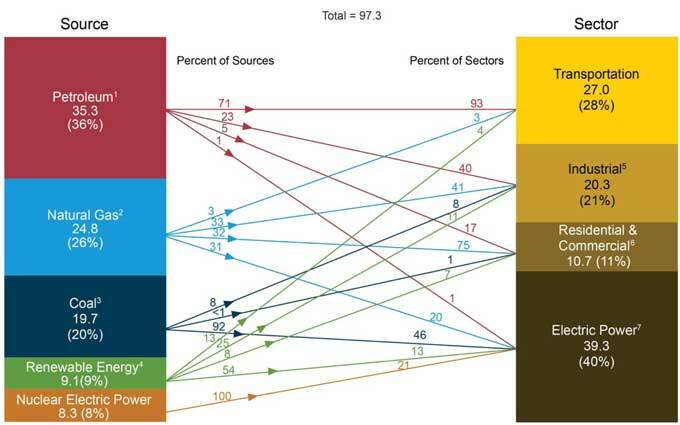 U.S. Energy Information Administration, Annual Energy Review 2011, Tables 1.3, 2.1b-2.1f , 10.3, and 10.4.